Is there snow where you live? If so, we’re betting you’ve been busy this winter shoveling your driveway. Why not enjoy some cake with your hot chocolate when you come in to warm up? Or if you’re lucky enough to live in a place that doesn’t get pummelled with snow, maybe shoveling the icing off this chocolate cake is the only snow clearing you’ll ever have to do! 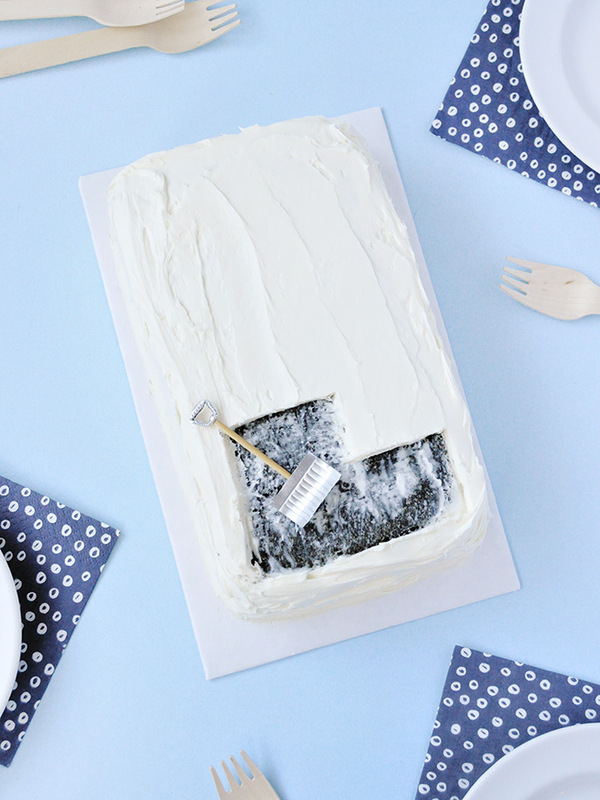 This would be a super fun cake to bake with your kids on a snow day this winter, or any chilly weekend really! Keep reading for the quick how-to below! 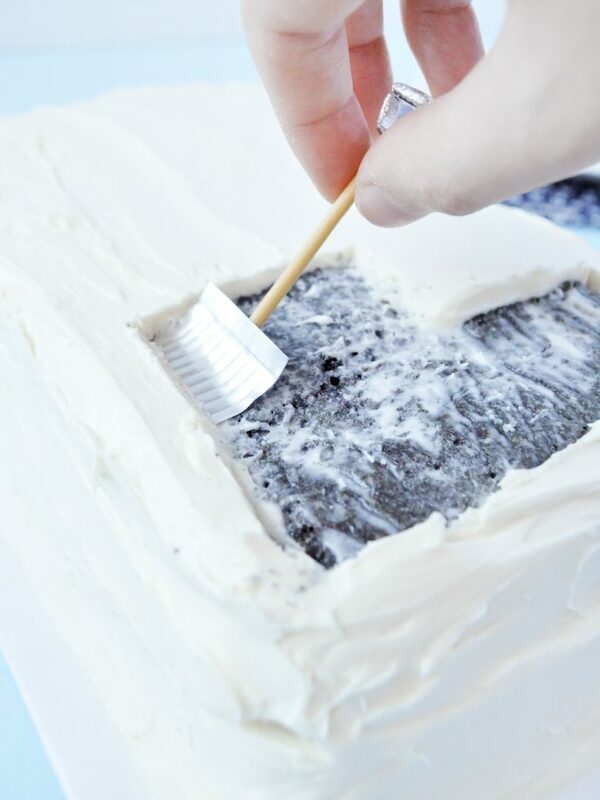 Begin by carefully cutting out a small rectangle of foil from your tray – make sure to use a pie tin or roasting tray and not just regular tin foil, as the trays are stiffer and will hold their shape much better for this. You’ll also want to cut a small length of the rolled edge of the tray to use as the top handle on the shovel. Next, cut a piece of wooden skewer a couple inches long. 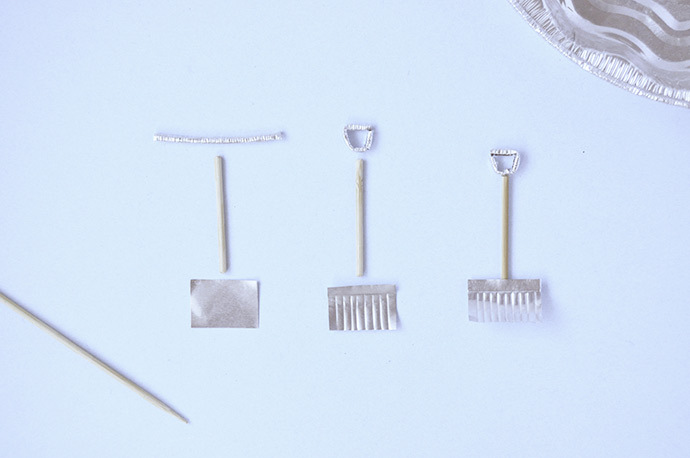 Prep the pieces by bending the rolled edge of the tray into a D shape, trimming off any excess. On the foil rectangle, use the leftover wooden skewer and a ruler (or any straight edge) to gently engrave one horizontal line followed by several equally spaced vertical lines below it. 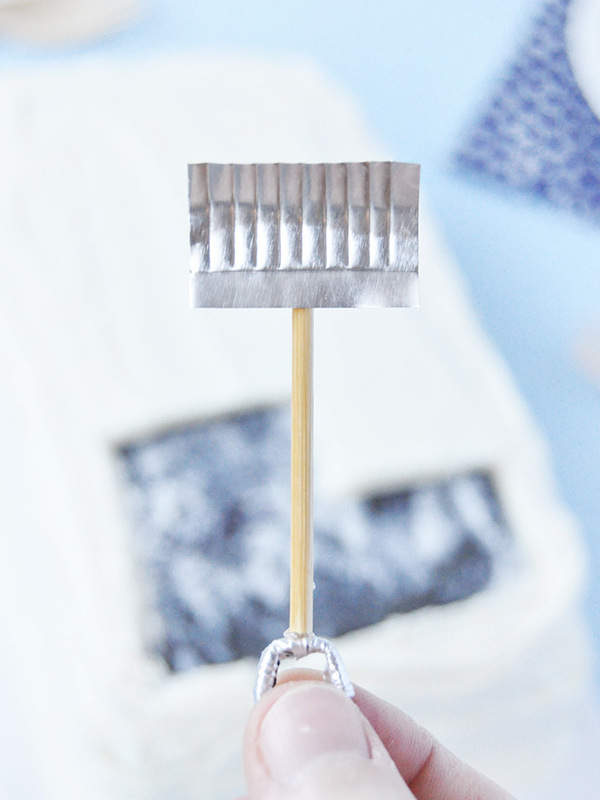 You can also gently curve it to make it look even more like a snow shovel. To assemble, simply use a dab of hot glue to attach the handle onto the top of the wooden skewer, and another bit of glue to attach the bottom of the shovel on as well. 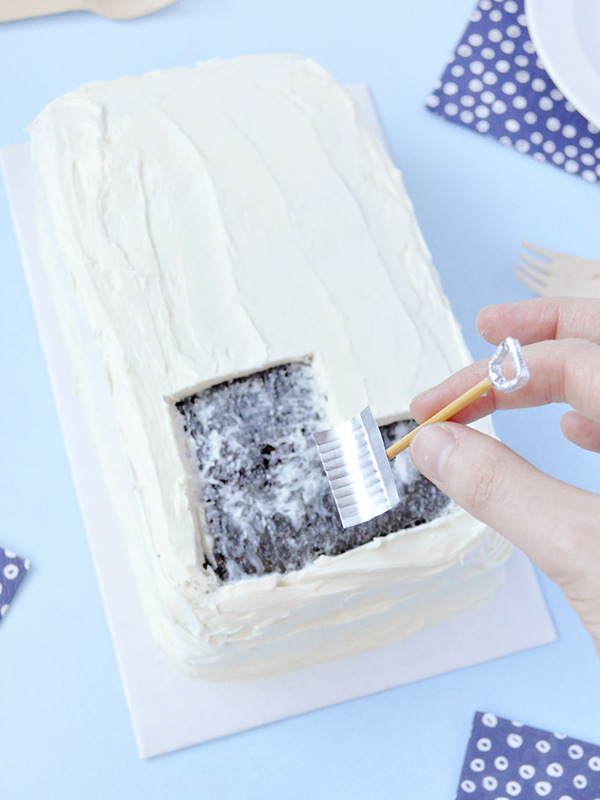 When decorating the cake, use a spatula or similar to clear the frosting snow off of part of the cake like we did. 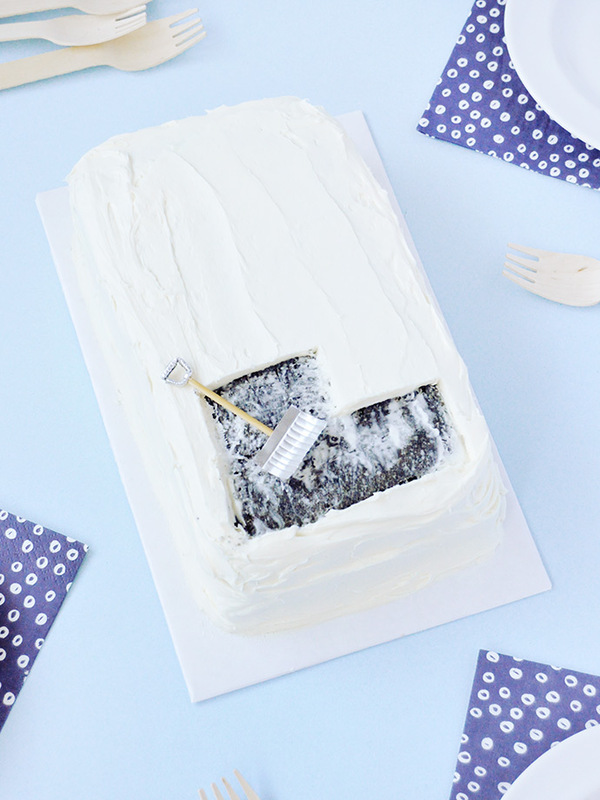 You can really use any flavored cake under the frosting, but we like that the chocolate cake gives a nice contrast to the white “snow”, kind of like you’re shoveling your actual paved driveway! Rest the shovel on the cake and enjoy! And don’t worry, you can always keep some extra frosting on the side in case whoever gets the shoveled slice wants a little bit more!